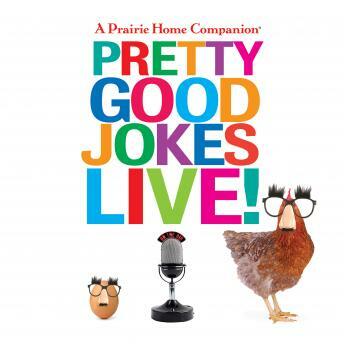 A Prairie Home Companion Pretty Good Jokes Live! Even more of a good thing: the latest collection of knee-slappers, toe-tappers, and groaners from A Prairie Home Companion Joke Shows. Jokes are made for sharing, and everyone loves to laugh. This nonstop collection gathers the best jokes from the most recent Joke Show (11/4/2014) plus special joke segments from 2011 to the present, all recorded before live before doubled-over audiences in Minneapolis, St. Paul, and New York . . . Performers include show regulars-Garrison Keillor, Sue Scott, Tim Russell, Tom Keith, and Richard Dworsky-along with special guests. There's music from the Guy's All-Star Shoe Band, a bucketful of Halloween jokes, a musical tribute to bad jokes, a celebration of Jewish Jokes from New York radio legend Larry Josephson, Ole and Lena jokes, a Guy Noir sketch, Dusty and Lefty, and of course, even more jokes. Prairie Home Companion Pretty Good Jokes Live!